Definition at line 42 of file llviewervisualparam.h. Definition at line 45 of file llviewervisualparam.cpp. Definition at line 58 of file llviewervisualparam.cpp. Reimplemented in LLDriverParamInfo, LLPolySkeletalDistortionInfo, LLPolyMorphTargetInfo, LLTexLayerParamAlphaInfo, and LLTexParamColorInfo. Definition at line 65 of file llviewervisualparam.cpp. 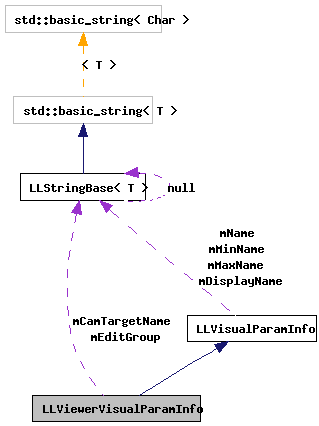 References LLXmlTree::addAttributeString(), FALSE, LLXmlTreeNode::hasName(), llassert, mCamAngle, mCamDist, mCamElevation, mCamTargetName, mEditGroup, mEditGroupDisplayOrder, mWearableType, LLVisualParamInfo::parseXml(), S32, TRUE, and LLWearable::typeNameToType(). Referenced by LLTexParamColorInfo::parseXml(), LLTexLayerParamAlphaInfo::parseXml(), LLPolyMorphTargetInfo::parseXml(), LLPolySkeletalDistortionInfo::parseXml(), and LLDriverParamInfo::parseXml(). Definition at line 44 of file llviewervisualparam.h. Definition at line 55 of file llviewervisualparam.h. Referenced by LLViewerVisualParam::getCameraAngle(), and parseXml(). Definition at line 54 of file llviewervisualparam.h. Referenced by LLViewerVisualParam::getCameraDistance(), and parseXml(). Definition at line 56 of file llviewervisualparam.h. Referenced by LLViewerVisualParam::getCameraElevation(), and parseXml(). Definition at line 57 of file llviewervisualparam.h. Referenced by LLViewerVisualParam::getCameraTargetName(), and parseXml(). Definition at line 53 of file llviewervisualparam.h. Referenced by LLViewerVisualParam::getEditGroup(), and parseXml(). Definition at line 58 of file llviewervisualparam.h. Referenced by LLViewerVisualParam::getDisplayOrder(), and parseXml(). Definition at line 59 of file llviewervisualparam.h. Definition at line 61 of file llviewervisualparam.h. Definition at line 60 of file llviewervisualparam.h. Definition at line 52 of file llviewervisualparam.h. Referenced by LLViewerVisualParam::getWearableType(), and parseXml().